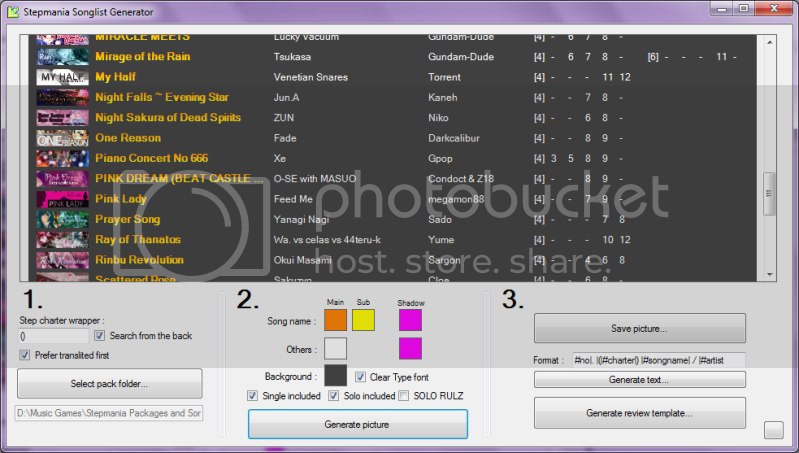 This program will automatically scan your pack folder and generate a songlist image from it. Should improve the stepmania appetite when saw. And you can see overview of charts available in the pack too. - And this program can't destroy your song packs because it only reads, not write. Play with other features yourself. - When using you should follow from 1 2 3 and up to down otherwise the program will crash and burn lol. - If banner isn't appearing you should check if the text in .sm match the file. - And there is a sorting bug when having non-english title but can be remedy by choose to use translited title first. Another bug is complex folder name like stacked parenthesis or brackets which the program WILL fail to retrieve step charter name. - For this new version it has support for folder which have only .dwi file as well. - If there is an .avi banner provided in .sm file or there is no banner file matching the ones provided in .sm file the program will try it's best to find any rectangular shaped image file instead of crashing. (Update!) Now support /: and /; in Stepmania 5 which will be converted to : and ; on the image. I really want it for my Pack please help!!! also, is any installation or file needed like runtime because i tried and cannot open the program? This is written on C# so you need .NET Framework 2.0 installed which most computer came with. On rare case that you didn't have this you can get it here.. Page created in 0.188 seconds with 50 queries.